The usual boiler that you are used to seeing is just a massive pre-heater of water so that you can have warm water only before you turn it on for a while. Needless to say, it takes too much space, time and efficiency away as there is definitely a much smarter decisions on the market. Why not consider installing a combi boiler? It goes without saying that it has numerous benefits. Let’s take a look at some of them. 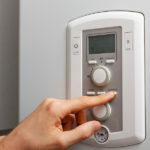 A combi boiler or combination boiler is much more efficient as it runs only when hot water is requested. For instance, you go in the shower, turn the shower on and in less than 10 seconds you have hot water, ready for you to enjoy your shower. Thus, only when needed, the boiler is turned on, which saves a lot of resources. Combi boilers are usually extremely easy to use as even kids can use them,. What is more, they are thoroughly secured so that you can be relaxed that your children are safe while taking a shower. If you have a smaller house or you simply do not want to waste all your space for a big, bulky boiler from the old ones, this is the best opportunity for you. It does not require some noticeable space from your house as it can be installed even in cupboards. Moreover, no tanks, placed on the roof are needed, which means that you will save money from the installation process as well as there is considerably less piping work to be done. On the whole, do not waste time, space and money on big bulky boilers as you can simply install a combi boiler in your house. One thing is for sure, you will not regret it. However, always seek professional help as even though the installation is nothing major, if not done correctly, it might ruin your boiler very soon. West Side Electric Service is a veteran owned local business. Our electricians and HVAC technicians serve the greater Nashville area including: Franklin, Brentwood, Cool Springs, Nolensville, Bellevue, Green Hills, Gallatin, Belle Meade, Hendersonville, Clarksville, Goodlettsville, Donelson, Lebanon, Hermitage, and Mount Juliet, TN.